I used to read her blog frequently. As blogging became more and more popular, I read more and more blogs on various topics and then started my own. She lived not far from where I lived at the time I was reading hers – and we even exchanged an email or two. Her blog is called Mommylife.net and as it became more about political topics, I didn’t read it as often and then got away from visiting it at all – since I have way too many blogs in my Reader. She was a prolific writer, full of purpose, full of faith, a champion of those with Down Syndrome, a person who “returned to the church (Catholic)” (her words), and a staunch conservative. She’d been open and transparent on her blog, and active in the issues of her neighborhood as well. She’d birthed 9 children – one with DS – and adopted 3 younger boys with DS. She was on blood thinners due to (I believe) a healing fractured leg this past summer while traveling. She suffered a hemorrhagic stroke this past weekend and the notices on various blogs began to appear asking for prayer. Then a couple of posts stated she was not expected to recover. Yesterday came the notice that she had died with her large family at her bedside. The internet makes for a smaller world, I am very saddened for the shock and sufferings her family will experience in the unexpected sudden loss of their mother and wife. The family has had more than their share of hardships – health, financial, and more. Once again, I am reminded that we make our plans, we have our things to do, our schedules, and we have way too much to do to DIE. We have purpose. We have things to say. We fill our calendars, of course. We are not waiting around for Death to find us. But still. There is a sad irony in that this very conservative blogger passed away before the election – and somehow it makes the election seem smaller while the loss of this person to her family is so huge. Rest in Peace, Barbara Curtis. For sixteen years, we lived in an old farmhouse. In the winter, it was an old cold farmhouse. 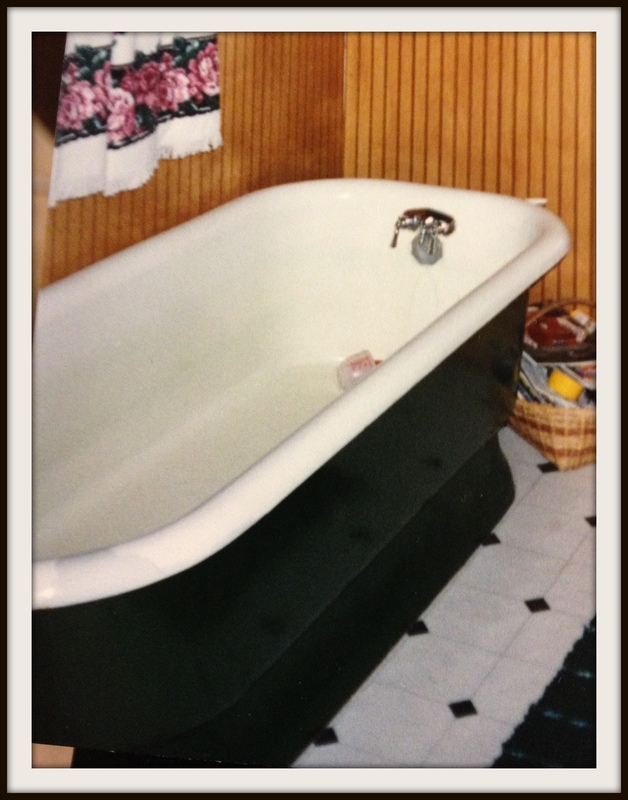 The tub pictured above often became a place of both warmth and respite. It was always a place to read. And yes, it was an escape from noisy, needy children. The tub was deep, and long enough that I could not reach the faucet with my feet unless I pointed my toes. I’d start out with very hot water – and as it cooled, I’d drain a bit and then add more hot to extend my time of “retreat”. I could fully immerse myself under the water and relax in the soothing warmth. At times, those little girls I’d be in retreat from would attempt to infiltrate and plead to join me. When the water was finally cool enough, I’d sometimes give in and ultimately my place of escape was no more. It was time to bail and leave them to their play. As an at-home momma, the occasional “abandonment” of my children felt necessary and was ultimately beneficial for them. Their father supported my retreat because he knew that the care of many small ones is hard work. Some days, he suggested I might need a bath. Being in the tub gave me permission to say “I can’t get _____, I can’t fix_______, I can’t come right now … I’m in the tub. Daddy can help.” Taking a bath gave reason to delay responding to their needs for at least a short period of time guilt-free – and motherhood already has enough guilt. The long, relaxing, hot baths are far more rare these days. The need to retreat is mostly gone. There are no more children knocking at the door, no requests for this or that. The house I live in now is newer, warmer, and far more quiet than that farmhouse ever was. I recently went to my local cell-phone service provider to upgrade my phone. I signed in at the kiosk, and went to take a seat on the 6 or 7 foot long cushioned bench. I sat about 1/3 of the way in on the bench since it was empty. Shortly after I sat down, a gentleman entered, signed in, and sat down as well. Next to me – about a foot away from me. He sat there even though the rest of the bench – and the other bench was empty. I found my reaction to his proximity interesting. I was immediately aware that it felt too close. I was slightly uncomfortable, but it’s a public place, so it was not that bad – just noticeable. Not surprisingly, within 30 seconds he was talking to me. Back to the Close Sitter. He started with the weather, and quickly moved on to how he’d almost called the police about the teenagers wandering in his neighborhood at 1AM because they had no good reason to be out and what were these parents thinking and he lived on Route 3 and worked in DC and needed to help his neighbor with a car repair and he’d just come from a doctor’s appointment and …. and….I was nodding, making brief eye contact, and acknowledging him minimally. I didn’t really want to encourage him to continue into deeper confessions – but I don’t think he noticed. I began to hope to hear my name called SOON. I was also wondering why I felt so uncomfortable. Just because a stranger sat close to me in a public place where I would not be threatened (presumably) and wouldn’t stop talking? Why did it even bother me? But in our culture, there is a personal space that feels appropriate. When you sit in an airport – (as I am now) – choosing a seat in the waiting area right next to a stranger if many seats are available is just not done. I am curious if my level of comfort is due to my culture or my personal reserve or the fact that I am an introvert. I wonder if extroverts in our culture talk to strangers immediately and I’d just never noticed? Do they pay less attention to personal space because their comfort level is different? Would this stranger have talked to me if I was with a friend? He was probably the type of person whose filters are a bit weak – not really recognizing my signals. My name was called, the Close Sitter remained – and my comfort level returned to normal. Life as a New Englander Introvert – is that a double dose? I just finished listening to a book called The Long Goodbye by Meghan O’Rourke. I found it while browsing through the audio books at my library. I had not heard of the book or the author, but since I enjoy memoirs, I thought I’d give it a try. Ms. O’Rourke writes about the too early loss of her mother from cancer. Her mother was 55 at the time of her death. She writes not only about the illness that leads up to the death, but also about learning to live without her mother in the world. She describes the physical sense of loss and her pain is palpable. In the past couple of years, two people I know have lost their husbands unexpectedly and far too early. Another friend shared that her father’s cancer has spread. He’s my age. I’m only a year younger than Ms. O’Rourke’s mother at the time of her death. I’ve recently had to start taking a med that helps lower risks of heart attack and stroke. I had a followup mammogram this week – always wondering if I will hear “negative” or have the direction of my life change suddenly. My parents are aging and will not be in my life forever. (Not leaving anytime soon, I hope!) These are among the reasons that I find myself contemplating this idea of loss – or of me “leaving” – more often than when I was in my 20s or 30s. There were some things that especially struck me while listening to the author read her work: the anticipatory grief that happens when a loss becomes obviously closer, that anticipating loss does not make it easier to bear, and that I hope I am here for many more years because my family might actually miss having me around. With aging parents who are in relatively good health, there is still a form of anticipatory grief – realizing that the years are passing and that your (my) life will not always have them present. That will be very strange but it is expected eventually. These eventual losses do not make me think they will be easier because they’re expected. Barring suicide, we do not choose whether we die suddenly or after fighting a terminal illness. I’ve joked about hoping for a little warning in order to tidy up around the house – boxes to the Goodwill to save work for the family. But it’s not very real yet – the reality of me dying or me losing a close family member. Ms. O’Rourke quoted from other authors she’d read in her journey through the first couple of years without her mother. C.S. Lewis’s book “A Grief Observed” may be my next read on the subject of grief and loss. I don’t think reading books on this subject will necessarily prepare me. As the author states, there are few rituals in our culture to help with processing grief. She admits that she may not even want to process it – but that loss and grief are in themselves a form of her mother’s presence remaining. Although the author does not have a defined religious faith, she has a semblance of spiritual contemplation over death and “where” her mother might be. I may not agree with her concept of afterlife but I appreciated her thoughts as she gave consideration to it. I would definitely recommend the book for those grieving as the author’s view from “the inside” may be comforting and feel very familiar. From this reader’s perspective, it was a thoughtful, touching memoir. It made me realize (once again) how much I appreciate my time with people I love since it passes so quickly. 1. Running will never be easy for me but I can do it in intervals. 4. When I am done with exercising my usual hour on the treadmill, I look “interesting”. 5. On less motivated days, I can talk myself into exercising by pretending “I’ll at least just walk a couple of miles”. Most often I do far more. 6. Exercise happens each week because I plan for which days it can happen. 7. Treadmill time without music would be far more difficult. 8. Every time I exercise, I understand why people do not do it. It’s hard. Very hard. 9. My default is lazy and passive, but I am still exercising three times each week. 11. If I contemplate doing this for the rest of my life….I cannot contemplate doing this for the rest of my life. A week at a time. 12. Keeping a food journal of everything I eat is eye opening. 13. A kitchen scale helps keep me honest in what to log into my food diary. 15. Portions on packaging are rarely realistically what I’d prefer to eat. 16. I have gotten better at adjusting to smaller portions and NOT cleaning my plate. Or making that cheesecake from Bravo’s last 3 days. 17, I can still eat cheesecake and chocolate and maintain (or even lose) weight. I cannot eat cheesecake and chocolate every day and lose weight. 18. Keeping a food journal is often tiring – but since it works – I will do it forever if need be. Better than NEEDING to do it (i.e. counting carbs as a diabetic). 19. 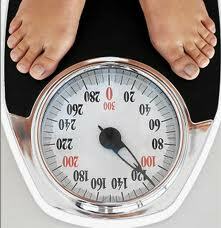 Weighing in every morning is what works best for me. I usually take the best of three. 20. I have exercised and kept a food journal successfully about 6 years ago – and lost 35 lbs. I stopped – thinking I had everything under control. I did not. I re-gained the weight. I would like to stick with it this time – even if it’s hard. Or boring. 21. Being female and menopausal has made being successful at these efforts more difficult. 22. Some people love to exercise. Or love to run. I mostly do not understand those people but I have glimmers of enjoying the challenge of exercising. I am so very blessed to live a life in which there is too much food available to me. I live a life in which I need to deliberately add exercise to my day to day life to increase my fitness level. Some people live in a country where they may have only one small meal a day (if that) or “exercise” by walking miles for clean water. Or some people would give anything to be able to exercise. This knowledge helps me to limit my whining.